About 15kkms away from Nalanda South West of Patna lies Rajgir known as Rajgriha or Girvraja in the ancient sanskrit text.The first Buddhist council following the Mahaparinirvana of Buddha was held here at Sarparni cave.Rajgir is noted for its hot spring at the foot of Vaibhara hills.In legends, Rajgir has also been linked to happenings during the time of Mahabharata. Rajgir today, is a small town with remnants of an ancient kingdom and beautiful temples. The serene and picturesque location makes it an ideal holiday destination. Rajgir is situated at southeast of Patna in the state of Bihar. Rajgir was the birth place and centre for many religious activities which was in the period of 6th century BC was the capital of kingdom of Magadh.Early records shows that Rajgir was referred by various names like Vasumati, Barhdrathpura,Girivraja, Kusagrapura, and Rajgriha.History dates back to the great Hindu epics like Ramayana and Mahabharatha where the former says that the mythical king Vasu, a son of Lord Brahma, founded this town and named it Vasumati.The story of Mahabharatha tells that Jarasandha who was killed by Bhima in a duel, ruled over this area and his capital was at Barhdrathpura.Though there are no referrences found with the detail of the other alternate names of Rajgir,however the present name is believed to be derived from Rajgriha.Buddhism records says that Buddha was here for a long time propagating his principes and doctrines. 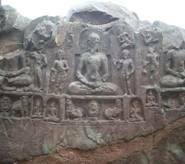 Jainism is also knitted with Rajgir for it says that the last apostle, Mahavira, passed 14 rainy seasons in Rajgir and Nalanda and it was the birthplace of Muni Suvrata, a predecessor of Lord Mahavira and the center of the Ajivika sect. This utsav is a major cultural fetsival which falls in the month of October. Various cultural events like classical dance, folk dance, music, and art performances takes place which invites a huge crowd. Malamasa is nothing but 13th day which comes once in three years according to ndan Solar calender which is celebrated in Rajgir as Malamasa Mela during which a large fair is held. This festival falls in the month of January during which people offer flowers to the deities of the temples at the hot springs and bathe in the holy water. This temple is situated in the hill crests around Rajgir where there about 26 Jain temples. Though it is a steep climb it is a very exciting trekking for those are interested. This is one of the must tourist destinations of Rajgir and sacred place of Hindus for it is here where Lord Buddha got enlightenment and he is believed to be the ninth incarnation of Lord Vishnu according to the Hindus. This temple is housed by a tower which is about 179ft in height and has a statue of lord Buddha and a Siva linga to the center of the temple. The vulture's peak is a famous destination spot of Rajgir with the Shanti Stupa being here built on the hilltop by the Buddha Sangha of Japan. It is in this place where Lord Buddha set in motion his second wheel of law and for three months every year during the rainy season, Preached many inspiring sermons to his disciples. Though there is a bridle path which leads to the temple people enjoy taking the Aerial Chairlift which passes over the beautiful scenic of the hills of Rajgir. One have to take the staircase leading from the foot of the Vaibhava Hills which ends to the sacred hotsprings.Separate bathing places have been organized for men and women and the water comes through spouts from Saptadhara, the seven streams, believed to find their source behind the "Saptaparni Caves", up in the hills. The hottest of the springs is the Brahmakund with a temperature of 45 degree Celsius. This cave is popularly referred by the name "Jarasandha ki Baithak" after the name of the King Jarasandha, a contemporary of Lord Krishna described in the epic Mahabharat.Pippala Cave is situated above the hot springs on the Vaibhava Hill and is a rectangular stone sculpted by the forces of nature which appears to have been used as a Watch tower. Soon it got the name of Pippala Cave for it became the resort of pious hermits. The life of Gautama Buddha, the founder of Buddhism is associated with the small town of Bodhgaya.It is one of the holiest pace SOF Buddhists faith.tread reverntly along the ancient path. Begin with the mahabodhi tree where something strange happened realization of truth or spiritual illumination. The tree still appears to radiate an aura of abiding serenity, spiritual solitude and peace. Tradition says that Buddha stayed in Bodhgaya for seven weeks after his enlightenment. Located 12 kilometers away from Rajgir, Nalanda houses the ruins of the famous Nalanda University. Nalanda was once the seat of higher learning but was devastated by a Turkish invader in the twelfth century. Wide spread campus of the university shows the grandeur and versatility of Nalanda University. According to Chinese traveler, Hiuen Tsang, Naland University housed more than ten thousand students and one thousand faculty members. The Chariot Route and hell inscriptions are worth a visit for the strangeness of the phenomenon, two parallel furrows cut deep into rock for about thirty feet giving credence to the local belief that they were "burnt" into the rock by the speed and power of Lord Krishna's chariot when he entered the city of Rajgir during the epic Mahabharata times. Several shell inscriptions, the undeciphered characters current in central and eastern India from the 1st to 5th centuries AD, and engraved in the rock around the chariot marks. 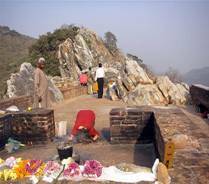 History quotes that this is the place where Lord Mahavira died and is at a distance of about 35kms away from Rajgir. This is a very famous tourist spot in Rajgir for it has two rock cut caves of which is believed to be the doorway to the treasury of King Bimbisara and the other was the guard room. Archeologists are still on excavations of this sight. This is the location where the royal physician Jivaka during the period of Ajatashatru and Bimbisara had his dispensary and it here where Lord Buddha was once brought to have a wound dressed. 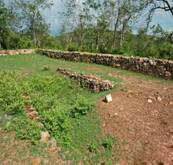 Though traces of Cyclopean Wall remains can still be seen in the exit of Rajgir to Gaya it was once a massive wall which was about 40 km. long. 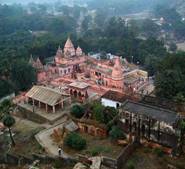 It is a beautiful architecture which belonged to the pre-Mauryan period. This is the place where Ajatashatru imprisoned Bimbisara.The captive king chose this site for his incarceration, for, from this spot he could see Lord Buddha climbing up to his mountain retreat atop the Griddhakuta hill. There is a clear view of the Japanese Pagoda. The stupa of peace was built on the top of the hill. 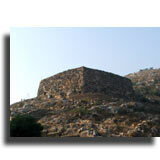 This fort was built by the famous Magadha king; Ajatshatru.He is also the builder of the Ajatshatru's Stupa. This is a small town on top of a hill and is located at a distance of about 25 km from the town. This place houses the tomb of a great Muslim saint of the 14th century; Makhdum Shah Sharif-ud-din.Bihar Sharif was once the capital of the Muslim Governors of Bihar between the 13th & 16th centuries when the city was an active cultural center & an important seat of Muslim thought & learning. Swarajpur Bargon is a place which is at a distance of about 18-km away from Rajgir.This tourist destination has a lake and a temple for the sun god. There are special chhat puja happening twice a year. Kundalpur is situated at a distance of about 18kms from Rajgir and is believed to be the birthplace of Lord Mahavir by the Digamber sect of the Jains.The main attraction of this place is a temple & two lotus lakes-the Dirga Pushkarani & the Pandava Pushkarani. Rajgir has not much to shop for it is more of a pilgrimage destination. Maybe one can check out for local handicraft and small religious items like beads, incense sticks, metal statues etc can be found available on the roadside shops. 06112(255616, 255216) Though there are very few hotels and restaurant in Rajgir,tourists can find good accommodation in the nearby town Patna which is the state capital. The nearest airport for Rajgir is Patna. There are regular flights for Delhi, Calcutta, Varanasi, Lucknow, Mumbai, and Katmandu from this airport. The nearest international airport is Calcutta. Rajgir is on a branch line of Eastern Railway and there are daily trains to Patna and other places nearby. There are regular buses from Patna, Nalanda, Gaya, and Bodhgaya to Rajgir. One can arrange for guided tour packages to Rajgir from Patna.